Oregon will not be among the semifinalists this season when March Madness concludes in Indianapolis this weekend, but the Ducks remain an integral part of the tournament’s history. 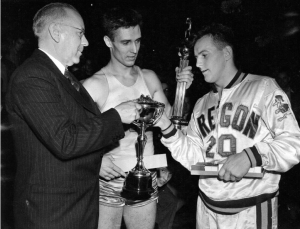 Last week marked the 76th anniversary of the inaugural NCAA men’s basketball championship, which was won by Oregon in a 46-33 victory over Ohio State on March 27, 1939. The “Tall Firs,” the nickname for the team originally coined by Oregonian sports columnist L.H. 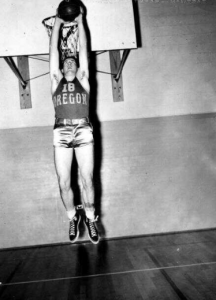 Gregory in March 1938, used a distinct size advantage to overpower their tournament opposition to claim both the Pacific Coast Conference and NCAA titles. The Webfoots first claimed the PCC championship in a best-of-three series against California, winning twice in Eugene to prevent a deciding third contest. The conference title earned Oregon a spot in the eight-team field of the NCAA’s first national tournament. After a barnstorming season that had taken the Webfoots to New York City, Philadelphia, Buffalo, Cleveland, Chicago, and other venues across the country, the Ducks settled in to win 16 of their 18 conference games. The combination of conference dominance and traveling experience would prove beneficial for Oregon as they advanced in their quest for the national championship. The quarterfinal contest against Texas initially appeared as though it would be a battle between two teams boasting height throughout their rosters. But the Longhorns, once they took off the ten-gallon hats and high-heeled cowboy boots they had been gifted for the journey to California, were at a distinct disadvantage. Though Oregon’s starting five looked sluggish in the first half of their third championship contest in five days, they nevertheless built an 8-1 lead in the first seven minutes and had extended the margin to 16-5 with seven minutes left in the half. Once coach Howard Hobson substituted Ted Sarpola for the 6’4″ Laddie Gale, however, the size advantage dissipated and Texas scored 11 straight points to tie the game. Late baskets by Oregon gave the Webfoots a tenuous 19-16 lead at halftime. In the second half, Oregon mounted “one of their famous rallies” to put the game out of reach, and Hobson substituted out his starting five once UO had built a 20-point lead. With the 56-41 victory over Texas, Oregon advanced to the Western finals to face Oklahoma. The Sooners challenged Oregon with their own version of fast-break basketball, taking several leads in the first half. With three minutes remaining before the intermission, Oklahoma held a 14-11 lead that UO fought to erase before the break. The fast pace had taken its toll on the Sooners, however, and the Tall Firs took advantage of Oklahoma’s fatigue to pull ahead decisively. In an era without a three-point line, Oregon continually forced the Sooners to take low-percentage shots from long range as they tried to rediscover some of the energy that had fueled the close contest in the first half. On the night, Oregon’s players combined to make 17 of their 21 free-throw attempts and 19 baskets from the field, eventually winning by 18 points to secure the Western title and a spot opposite Ohio State in the inaugural national championship. Immediately after the games in San Francisco, Oregon boarded a train headed east for Chicago. The first NCAA championship was played at Northwestern University’s Patten Gymnasium, providing the Buckeyes with a geographic advantage. But the comprehensive non-conference schedule had prepared the Tall Firs for long road trips and unfamiliar venues, negating much of the potential advantage for Ohio State. Back in Eugene, the citizenry listening to the championship on the radio took to the streets, honking car horns and commencing an impromptu rally at the intersection of Willamette and Broadway downtown. Two days later, thousands flocked to the train station upon the Tall Firs’ arrival back in Eugene. 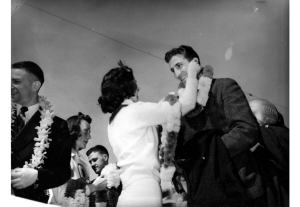 The city embraced the victorious Webfoots, who brought home the University of Oregon’s first national championship in any sport. 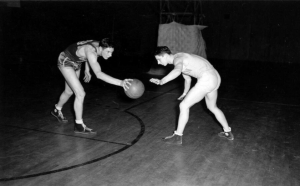 76 years later, their legacy provides the standard to which generations of Duck basketball teams have aspired. Charles R. Buxton, “Oregon Steamrollers Buckeye Five 46 to 33 to Take National Title,” Oregonian (Portland), March 28, 1939, 1. 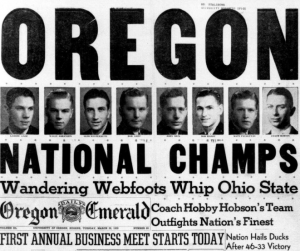 Charles R. Buxton, “Webfoots Win National Title,” Oregonian (Portland), March 28, 1939, 15-16. 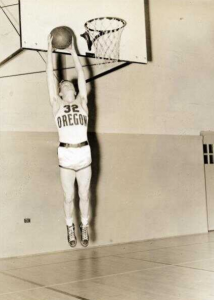 Joe Gergen, The beginning: Oregon is king – 1939,” Sporting News, 2006. L.H. Gregory, “Oregon Triumphs over Texas, 56-41,” Oregonian (Portland), March 21, 1939, 17-18. L.H. Gregory, “Oregon Hoopmen Western Champs,” Oregonian (Portland), March 22, 1939, 17-18. L.H. Gregory, “Gregory’s Sports Gossip,” Oregonian (Portland), March 27, 1939, 17. Scott Gummer, Mac Court Memories: The Illustrated History of McArthur Court (San Rafael, CA: Insight Editions, 2010). “Oregon Wallops Texas 56-41 in N.C.A.A. Hoop Tournament,” Register-Guard (Eugene), March 21, 1939, 8. “Oregon Quint Eyes National Collegiate Hoop Championship,” Register-Guard (Eugene), March 22, 1939, 6. “Oregon’s ‘Dashing Ducks’ Win National Collegiate Athletic Association Basketball Championship,” Register-Guard (Eugene), March 28, 1939, 6. UOregon, “1939 NCAA Championshipo: Tall Firs,” YouTube, July 24, 2012. Photos sourced from the University Archives Photographs (UA Ref3) and UO Digital Collection — UO Athletics. I’m a native Californian, but went to college @ Oregon, Both sets of Grandparents were Oregonian’s, Springfield & Cave Junction, Gpa and Many Aunts, Uncles and Cousins Love them Ducks.. Congrats to the Tall-Firs, true “TrailBlazers”..